Kitchens come in all shapes and sizes, and sometimes homeowners will compromise on the kitchen initially with visions of improving it later on. The kitchen is quite often a bustling place for cooking meals and entertaining. If the space is limited, don’t feel cheated. Get creative! Consider some useful ideas for maximizing kitchen space and your less-than-ideal kitchen will feel like a perfect fit. Every new year sparks the urge in most people to think about what they’d like to accomplish in the year. Some resolutions can be difficult to keep up with, and some are longer term goals that lose momentum over time. That doesn’t stop us from making them! When it comes to home projects and repair, there are many lofty goals you can strive for, as well as small accomplishments. We put together a list of ideas, big and small, of potential New Year’s goals for the home. Get started with your planning early and be ready to start the year off right. Let us know what your goals are in the comments! Rolling library ladders are no longer strictly for rooms of books. If you have a home with high shelves, especially in the kitchen, a rolling ladder can be a great aesthetic and functional addition. Take advantage of a lofted space with a ladder, and use it for storage or another access point to a room. Rolling ladders can be set up with curved railing so that it can function throughout an entire room. From tall, walk-in closets to high shelves in the kitchen, rolling library ladders can be useful just about anywhere. Changing hardware is a great way to make a room look fresh. Crystal knobs will reflect the light in the kitchen. Antique bronze drawer pulls give a bit of a different look, and enhance the rustic appearance, especially if your cabinets are worn down. The bathroom and the kitchen are the two main rooms to update with new hardware given the cabinet doors and drawers. This can tie in with the next item below as well, if you have the time and money to update the cabinets or vanity further. 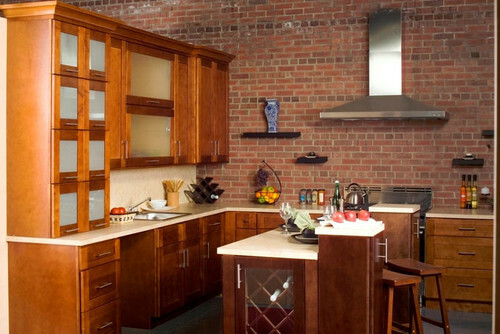 Depending on your budget, updating your kitchen through the cabinetry is a great way to do it. Pick out a new color or stain, and it’ll only take a few days to paint the cabinets, including preparation. The prep work for the cabinets will take the most time, including cleaning and taking apart the pieces to paint. Another choice is to reface the cabinet doors with new veneer panels. Cooking and heavy use can wear out cabinets, and choosing veneer panels to reface the cabinet doors cleans it up without too much cost or labor time.